Dosage: For oral administration and short-term use only. Adults and children & adolescents between 12 and 18 years: Swallow 1 or 2 caplets with water, up to three times a day as required. Leave at least 4 hours between doses. Do not exceed 6 caplets in 24 hours. Do not give to children under 12 years. Children and adolescents between 12 and 18 years: If the product is required for more than 3 days, or if symptoms worsen a doctor should be consulted. Adults: If the product is required for more than 10 days, or if symptoms worsen a doctor should be consulted. Read the enclosed leaflet carefully before use. 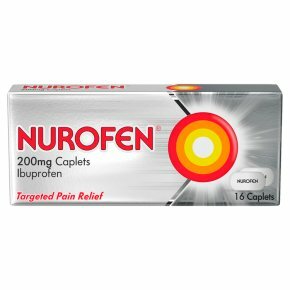 DO NOT TAKE IF YOU:<br>Have (or have had two or more episodes of) a stomach ulcer, perforation or bleeding<br>Are allergic to ibuprofen, to any of the ingredient, or to aspirin or other painkillers<br>Are taking other NSAID pain killers or aspirin with a daily dose above 75mg<br>Are in the last 3 months of pregnancy.<br><br>SPEAK TO A PHARMACIST/DOCTOR BEFORE TAKING IF YOU:<br>Have or have had asthma, diabetes, high cholesterol, high blood pressure, a stroke, heart, liver, kidney or bowel problems or are dehydrated<br>Are a smoker<br>Are pregnant<br><br>WARNING: Do not take more medicine than the labels tells you to.<br><br>KEEP ALL MEDICINES OUT OF THE SIGHT AND REACH OF CHILDREN.